Pauline Foster is a solicitor (Australian-Qualified) in the Corporate team at Hayes Solicitors. Pauline specialises in company law and provides transactional and advisory services to private companies and financial institutions. 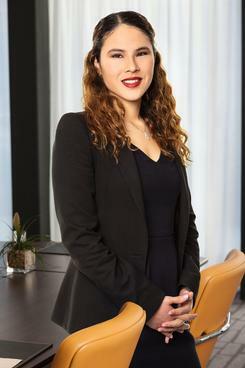 She assists in advising on domestic and cross-border mergers and acquisitions, corporate reorganisations, shareholder agreements, business structuring and formation, corporate governance and compliance and other commercial arrangements and contracts. Pauline has assisted in advising both international and Irish-based private companies across various industry sectors including the technology, financial and retail sectors, ranging from SMEs to large multi-national corporations. M&A – acting for both buyers and sellers of businesses across various industry sectors including the technology and retail sectors. Corporate reorganisations – assisting in advising on the corporate law aspects of international intra-group restructuring projects. Corporate governance and compliance – assisting in advising international corporations on corporate governance and compliance, including attending director board meetings, drafting quarterly board minutes and researching corporate law issues. General commercial arrangements and advice – assisting in drafting shareholders’ agreements, dividend distribution documentation, shareholder and board resolutions, trust deeds, company-type conversion and re-registration documentation, company formations, intercompany funding arrangements and advising on optimal business structuring. Data protection law – assisting in advising a large international corporation on compliance with the General Data Protection Regulation (GDPR). Intermediate working knowledge of French and German.